Johns Hopkins University’s Near Earth Asteroid Rendezvous – Shoemaker (NEAR Shoemaker) robotic space probe was launched in 1996 to study the asteroid Eros. 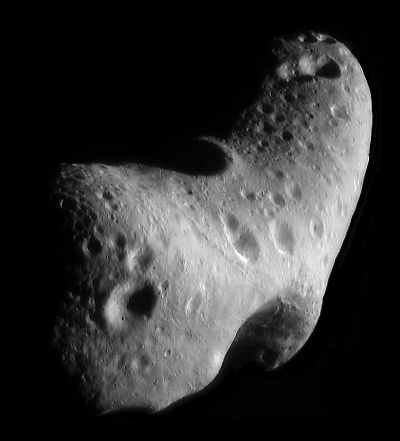 This picture is a mosaic of six pictures, stitched together and layered over a computer model of the asteroid’s shape. The NEAR Shoemaker probe was about 200 kilometers from Eros at the time of these photos. 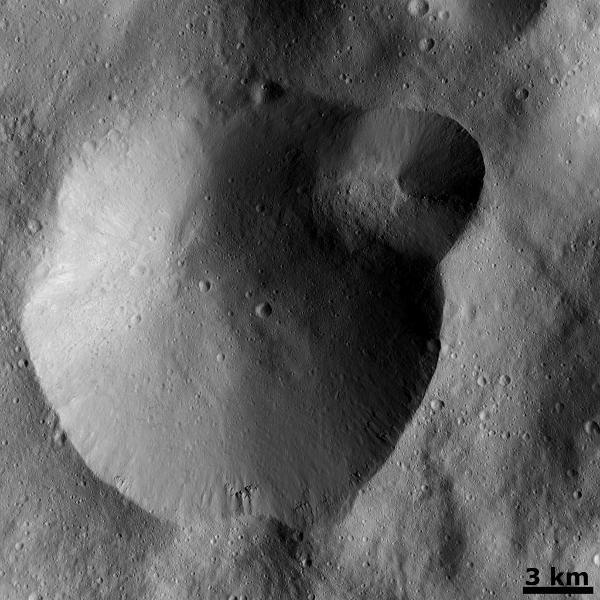 Several large craters are clearly visible. At the end of its mission in February 2001, the spacecraft landed on Eros. On Wednesday evening, a massive 100-foot wide Asteroid 2014 DX110 passed between Earth and the Moon, about 346,000 from Earth (0.9 lunar distance). DX110 was tracked by NASA Jet Propulsion Laboratory’s Near-Earth Object Observations Program (Spaceguard) and several other organizations. Here is a time lapse video of the asteroid from the SLOOH community observatory. The Catalina sky survey also tracked a smaller asteroid, 2014 EC, about 20 to 30 feet wide and 500 to 600 tons in weight. 2014 RC will fly by much closer (62,000 km) to Earth around 1:21PM (PST) on March 6, 2014. JPL picked up yet another asteroid, 2014 EF, which was a bit smaller and further out than 2014 EC and also passed by Earth yesterday evening. There were some speculative reports that 2014 EF may have entered Earth’s upper atmosphere and broken up over Venezuela, landing into the Pacific Ocean, but this has not been corroborated by NASA or any other organizations. All in all, a very busy couple of days for asteroid hunters.